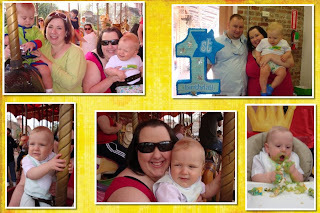 We celebrated Noah's birthday this past Saturday at the Audubon Zoo. A few months back at the event we had at Cabrini for the scholarship for Vanessa, I won a birthday package for a carousel party. I can't go on enough of how great the party was. It was supposed to rain Saturday BUT it didn't, we definitely lucked out! The room was so incredibly cute. The decorations on the wall, to the "thrown" chair for the birthday boy, to the soap holder, everything was in theme. It was such a great room. The kids were able to ride the carousel (and I think just about all adults took a ride on it at least once too!). At first Noah was a bit unsure of the carousel and didn't like it, neither did Deuce. However, the next few times I really think he got the hang of it! We had cake, of course, and Noah became a complete mess! I really wasn't planning on him destroying the cake as he did, but oh well. All in good fun right? It's a fact that Noah loves cake and love may actual be an understatement. He can definitely put down some cake. He tore it up! Thankfully I had an extra change of clothes AND the icing came out of the white bib and his birthday outfit...phew! I'm so lucky to have such generous family and friends. Noah received some awesome gifts! You all rock! It says I need ID to see your scrapblog of the party?